Going entirely paperless may be great for Mother Nature, but it may create a nightmare for your loved ones later. Those online payments mean user ID’s and passwords, and if they are not written down, your loved ones may have trouble putting your finances in order. If something were to happen to you right this instant — say you keel over in excitement from all the great information on MomVesting — who would know what you owe and to whom? Would they know your login information? Probably not. That’s the problem with going paperless. There is a way to save your family the headaches of figuring out your finances: organization. I have a great organization plan that may save you some time and hassle, so let's look at some ways to organize your monthly expenses. Whether you still get invoices and statements through snail mail or you choose to hit “print” every once in a while (a shout out to the green crowd! ), what do you do with all of that paper? Do you stack it? Throw it in a drawer? Check it and shred it? Maybe you check it and chuck it? Seriously, what do you do with all that paper? The answer is actually very important. We have to figure out your natural tendencies before we can devise an organizational system that complements them. The key is to develop a system that fits your personality but can be navigated by a stranger. 'Cause that great system of organization you have in your head won’t do anybody any good if something happens to that precious noggin of yours. Think on your paper tendencies for a minute while we lay out some other ideas in organization. Let's devise a plan for your organization based on my own. First, grab a dark pen (or fine point Sharpie), a piece of paper, 1 ½ to 2 inch three-ring binder and dividers (we’ll figure out how many you need in a minute). Note: If you’re like me and everything has to match, get an extra pack or two of dividers. That way, if you ever need to replace or add a divider, it will still match and look nice. When it comes to organizing, it’s important not to get the cart in front of the horse or the process can quickly become overwhelming. So let’s get the binder together before you start worrying about filling all that paper you're still mulling over. Step 1: Designate your folder. Use a 1 inch by 2 5/8 inch blank address label for the binder edge. Label it with your name, followed by “Finances.” Don’t be tempted to put a year on it. This file will always be current; we’ll conquer out-dated papers later. If the binder you used for your current binder was labeled, say, 2001, your family members might set it aside as outdated when you passed away, causing them undue strain. Step 4: Happy hunting! Remember your paper tendencies you were mulling over? Well now's the time to use the info. Go through all that paper and find the most recent statements for each of your expenses. If you don’t have one, go online (if possible) and print out the most current statement. Also gather the most current bank statement for your checking account. Insert the invoices and statements behind the correlating tabs. One way I make my financial life much simpler is to pay all of my bills on the first of the month. If one isn’t due until the 26th of the month, I call in or go online to schedule the payment for three to five days before the due date. You too can follow this system. It really does make finances much more streamlined. 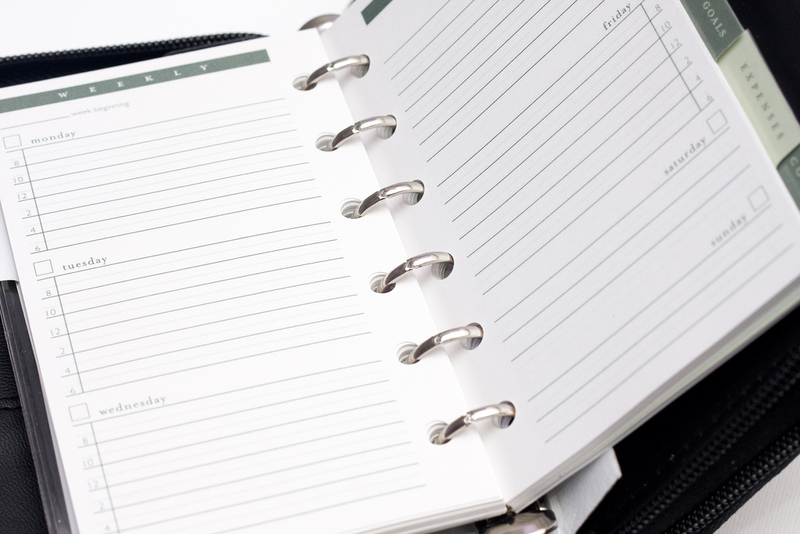 Next make a list of your monthly expenses (your Monthly Expense Report) and insert it at the front of your binder. Now on the first of each month, sit down with your binder and checkbook (or computer) and fill this out. Once it’s complete, place it behind the Monthly Expense Report tab and fill in as much as you can for the next month (description, due date and minimum due). Final step: Sit back and live stress free for the rest of the month. Well, almost. I hope my organization tactics can help you develop a system for your monthly expenses. If you also have a great system, please share it in the comments section below! that's a great idea - not only will it help family members in the event of an umtimely (or timely) demise, but it will help you stay organized. I imagine that it's also a nice feeling to move an old bill (like an auto payment) out of the binder for good when it's paid off. We recently made a household folder. It really has put my mind at ease, since I am the bill payer and if anything ever happened to me my husband would have no clue what to do. We use Quicken and we find it works great for outlining our expenses and keeping us on track. We can even review our budget with it and make changes. I like that it is greener too. Niki - I can completely relate to your sentiment. My husband is brilliant and has every capability imaginable, but if something were to happen to me, he would be lost without our financial folder.